Pasta is a weekly dinner in my house. My family loves it and it's usually easy to make, which is a win win in my book. RAGÚ has always been my go to pasta sauce. 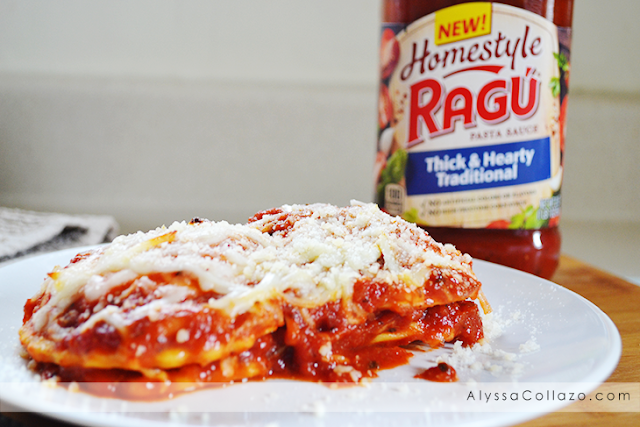 And their new line of sauce– RAGÚ Homestyle is no different, plus it's incredible. Its thick and hearty texture hugs every noodle, and provides a delicious made-from-scratch taste! Which my daughters love and it's also available in 5 bold flavors. Traditional, Meat, Roasted Garlic, Four Cheese and Mushroom. RAGÚ knows a great sauce starts with great ingredients! Which is just another reason why I love RAGÚ. And if you are like me and don't have a lot of time but are looking for a delicious recipe, my 3 Ingredient Ravioli is a must try! It's so easy to make and it's a family favorite. For this recipe I usually use RAGÚ Six Cheese sauce but this time I am using one of their sauces from their Homestyle line, RAGÚ Traditional and can I just say, I am absolutely loving how thick and hearty this sauce is! It definitely made a difference and next time around I plan on using RAGÚ Roasted Garlic! Heat oven to 350 degrees - Spray bottom and sides of your 8x8 baking dish with cooking spray. 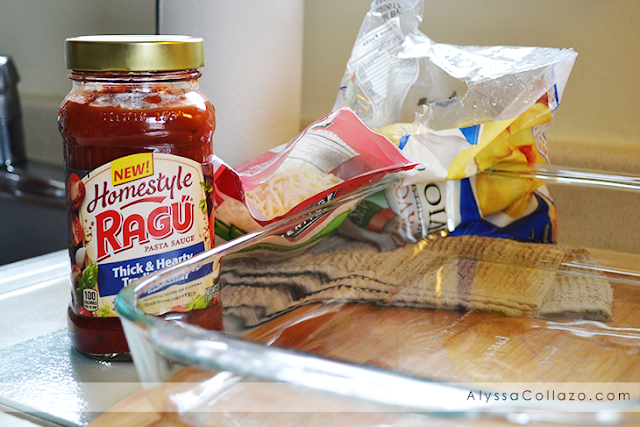 Spread 3/4 Cup of your RAGÚ Traditional sauce in the baking dish. Arrange half of the frozen ravioli in a single layer over sauce - top with half of the remaining RAGÚ sauce and 1 Cup of the mozzarella cheese. Repeat layer once, starting with ravioli. Cover with aluminium foil and bake for 40 minutes. Remove foil and bake uncovered for 10 - 15 minutes or until bubbly and hot in the center. Let stand for 10 minutes before cutting. Simple, right? And you have a delicious meal and all you needed was 3 ingredients! I mean it doesn't get much easier than that. I like to garnish my plate with parmesan cheese. 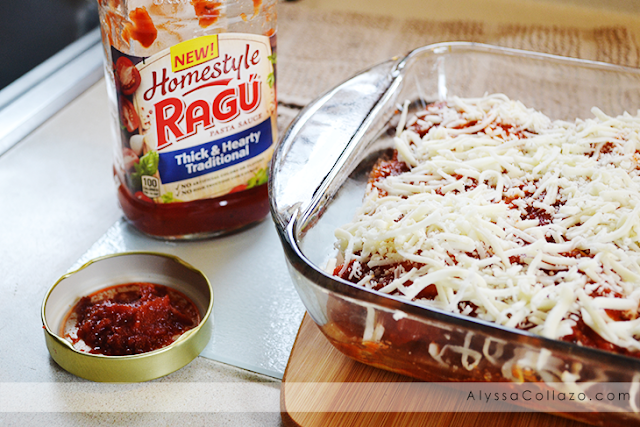 Which RAGÚ Homestyle sauce would you try with this recipe? Be sure to check out RAGÚ for more delicious recipes. 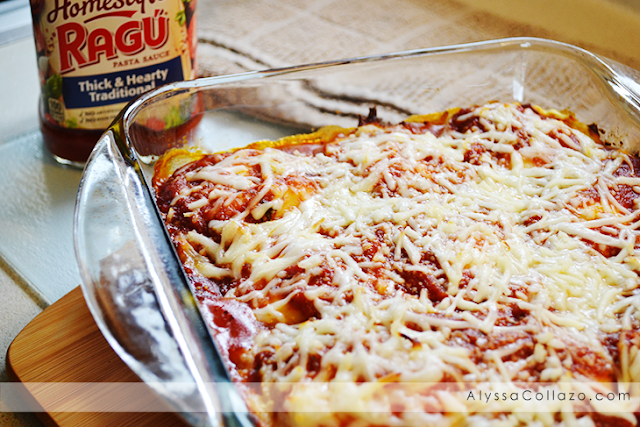 Do you have any RAGÚ inspired recipes? I am ALL FOR easy peasy meals like this! I will definitely be making this for my family! Raviolis are without a doubt my favorite food. My mouth was watering while reading this! I always make my own sauce as store bought contains things I don't like. This recipe looks good and I am going to try it. Thanks for sharing. Love this, so easy and quick. I could throw this together in a flash... which is sometimes what I need. Love your recipe. I just used Ragu with Mushrooms the other day, with Rotoni pasta, sausage and cheese. This is a family favorite. Pasta is so one of my favorites because it's easy to make. It's perfect for busy night when I don't have a lot of time to make dinner. This ravioli recipe looks so good! I love this pasta recipe, my son will surely love it too. I haven't tried this brand but I will. Being quick and easy means its a win from me. This looks really yummy and cheesy. My son loves pasta and cheese and in fact his favorite is mac n' cheese. I love easy to prepare meals. I also love Ragu and am glad that they have come out with a thick and hearty sauce! Now this looks like a meal I can whip up on a busy weeknight. And I just love Ragu. Love it that is so easy and quick. It's great being able to put it all together and so easily! Pasta is a weekly dinner at our house too, so I love new recipes. Baked pastas are always a hit. 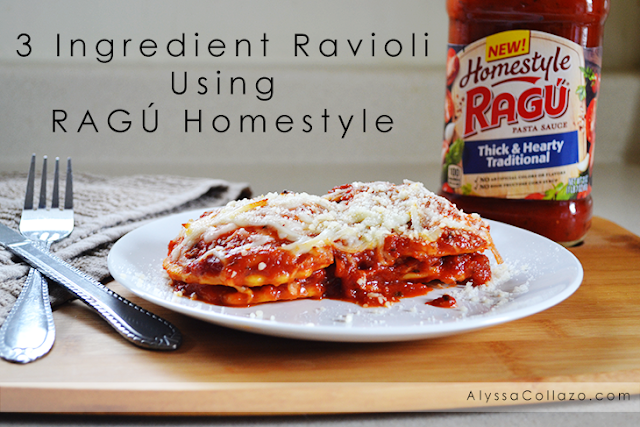 I keep seeing this Homestyle Ragu everywhere, and have not had a chance to try it out yet. This ravioli looks really tasty! I love pasta and this recipe is bookmarked! Looks rich and tasty, I always love a good ragu sauce and this recipe sounds like something my family would adore! I love Ragu. It is the only base I will use for my spaghetti sauce.